For making of human figures with clay materials, it takes skill to make the construction of steel wire as the framework of figurative sculpture. 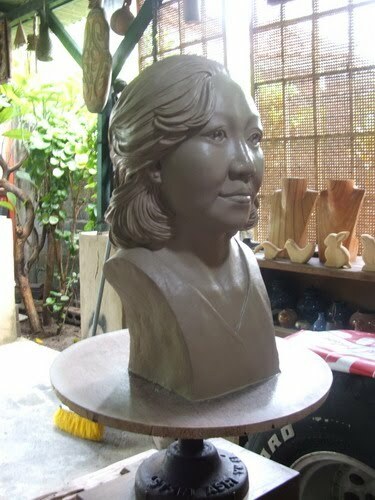 Construction of human figures is different with head's sculpture model. Sculpting head is simpler than human figure model. Lessons of the construction of human figure model are the most important. Where a construction error and misjudged the gravity point, models clay would collapse before the sculpture is finish. For these, students were given basic knowledge of human anatomy. From this anatomy lessons students can make the motion and the human form naturally and beautiful. The students will make a sculpture of human figure as high as 60 cm to 75 cm takes approximately five days depending on the concentration, the talent and the intensity of the pupils concerned. 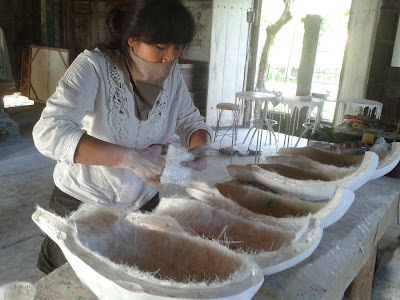 As already known, Tabanan and Ubud are famous for the production of natural stone which is called 'sandstone' (soft stone). The aim of studying stone carvings is to direct students to understand the characters of natural stone and forming the stone accordance with their creations and talent. Instructors will direct the forms they created in accordance with the rules of sculpture without affecting their desire to create a form in accordance with what they imagine. 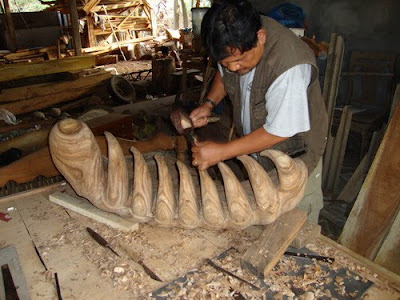 As known to the world that Indonesia has various types of wood. We used ‘Suar / Trembesi’ wood as raw material for wood sculpture. ‘Suar / Trembesi’ wood (an umbrella wood) is taken from the timber production forest with diameter 30 cm and 100 cm long. At the end of the course students usually want to bring home their work. For that course management will be provide instructors to teach the students how to make molds and produce the positives results. For an illustration to make a print head, the positive result of gypsum material and resin or fiberglass takes three days. While the human figure to mold with the same ingredients it takes five days. Material to make a mold which is used is cement, gypsum, silicon and resin (fiberglass). Each material has properties, techniques and different prices. Silicon is relatively the most expensive material as compared with resin and plaster. The price of resin is relatively more expensive than plaster and cement.